velyn Pickering, who was born in London the daughter of upper-middle class parents and the niece of Rodhamn Spencer-Stanhope, was a painter within the circle of later Pre-Raphaelites who took their inspiration from the more romantic paintings of Rossetti and Burne-Jones. Her early ambition to paint was discouraged by her parents but later she was permitted to become a student at the Slade School and in due course to study in Italy, in Rome and in Florence. 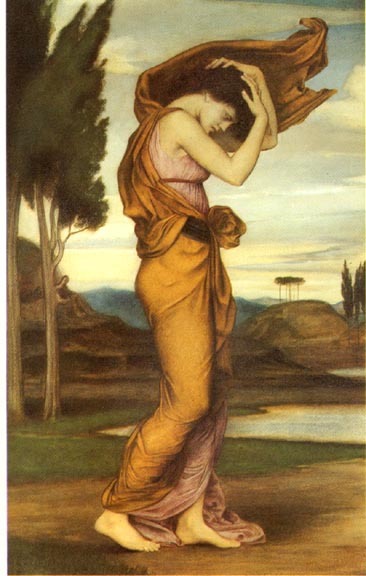 As a young woman she exhibited Ariadne in Naxos at the first Exhibition of the Grosvenor Gallery in 1877. Newall, Christopher. A Celebration of British and European Painting of the 19th and 20th Centuries. London: Peter Nahum, 1997. Pp. 26-27. Sparrow, W. Shaw. "The Art of Mrs. William de Morgan." The Studio. 19 (May 1900): 220-32. [Full text]. Stirling, A. M. W. William de Morgan ond his Wife. London: Thornton Butterworth, 1922.